Mass gain is no child’s play and MuscleBlaze® knows the science and mechanism of how to grow big and sturdy muscles. 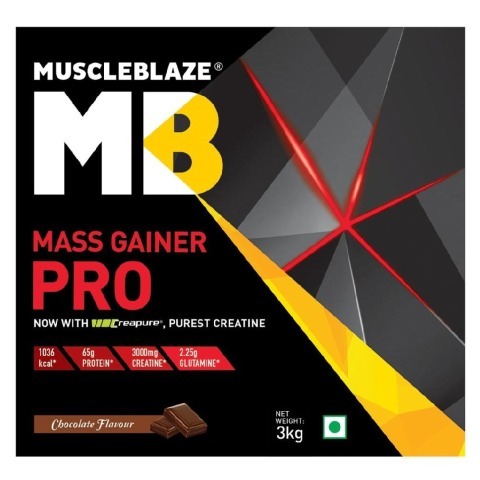 Bringing to you the new MuscleBlaze® Mass Gainer Pro, powered by Creapure, this mass gain formula boosts your gains and help you achieve those strong and sturdy muscles in shorter time. 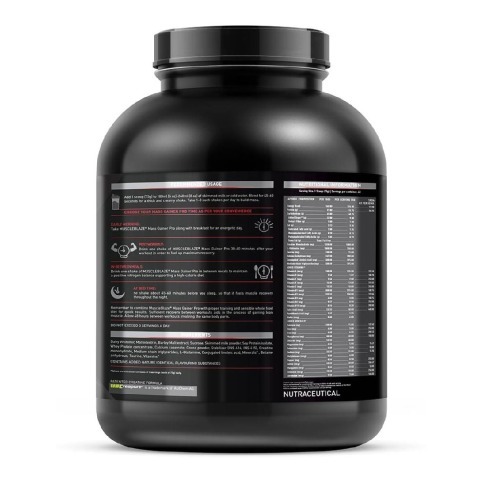 With a ratio 1:3 for protein to carbohydrates, this mass gainer formula elevates your muscle synthesis and helps you build huge and sturdy muscles. 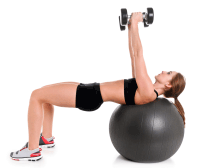 You can then sculpt your body the way you want! The new and improved MuscleBlaze® Mass Gainer Pro is fortified with 48g of carbohydrates per serving which is derived from the complex sources to provide a sustained release of fuel for muscle build-up up to long hours. With 15g of time release proteins in each serving, this Mass Gainer Pro helps boost recovery and muscle build-up post an intense workout. 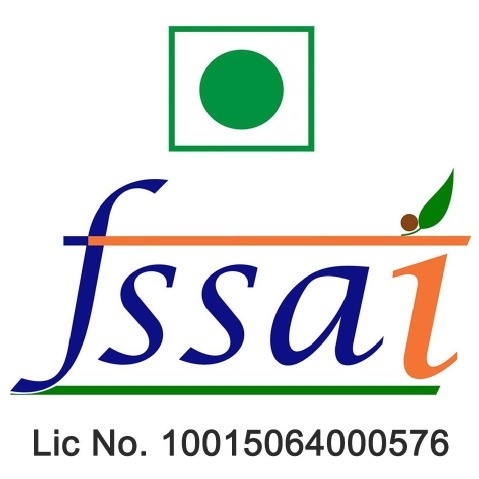 Conjugated Linoleic Acid helps convert the assimilated fats in the body into muscles by transporting the fats to the muscle tissues where it is burned as fuel during heavy-duty workouts. Add 1 Scoop (75g) to 180ml of skimmed milk or cold water. Blend for 45-60 seconds for a thick and creamy shake. Take 1-3 shakes per day to build mass. What is MuscleBlaze Mass Gainer Pro? 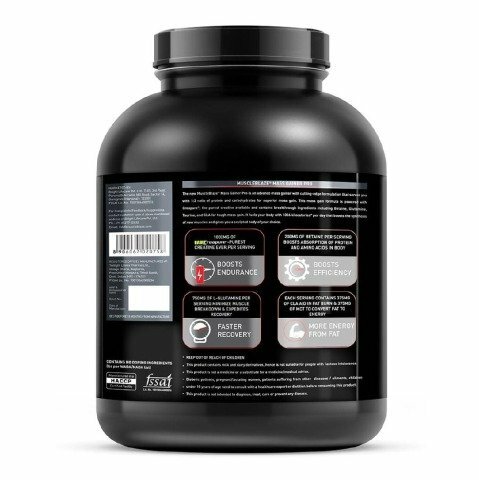 MuscleBlaze Mass Gainer Pro is a scientifically engineered formula loaded with Creapure®, the purest form of creatine, and has added Betaine and Glutamine to fire quick muscle gains in bodybuilders. 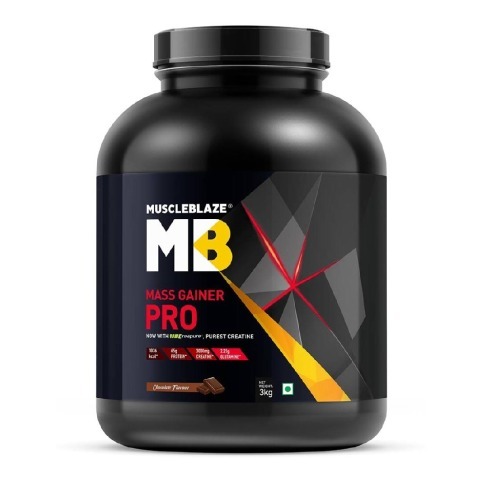 Featuring protein and carbs in the ideal ratio of 1:3, MuscleBlaze Mass Gainer Pro enables you to bulk with unadulterated muscle mass and negligible fat. The perfect blend of RDA compliant 27 vitamins and minerals in MuscleBlaze Mass Gainer Pro improves muscle stamina and optimizes daily workout results. How Creapure® is different from other creatine? Manufactured by AlzChem AG in Germany, Creapure® is the purest form of creatine available. 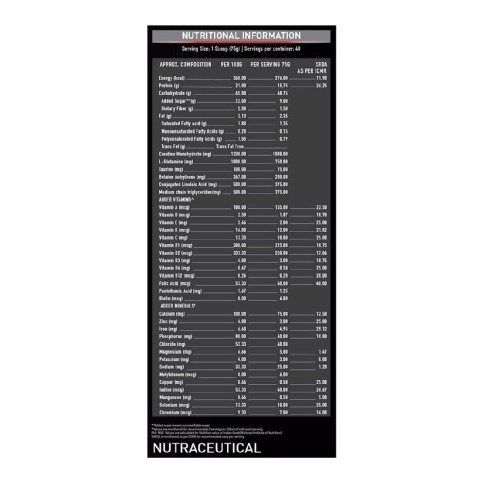 While most creatine available in the market has a creatine content of around 99.9 percent, Creapure® is 99.99 percent pure creatine, which makes it the best creatine available for fitness enthusiasts and athletes, as the difference of 0.09 percent could have a substantial effect on their performance. 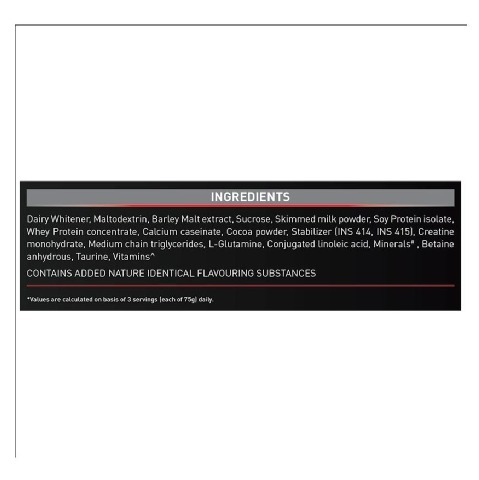 How additional ingredients increase efficacy in MuscleBlaze Mass Gainer Pro? The perfect blend of RDA compliant 27 vitamins and minerals in MuscleBlaze Mass Gainer Pro improves muscle stamina and optimizes daily workout results. Regular use enables bodybuilding enthusiasts to successfully transform their physique with almost negligible fat. The unique mix of Betaine and Glutamine in MuscleBlaze Mass Gainer Pro helps bodybuilders to take training to the next level. 3.0g Betaine, an amino acid supporting alpha performance helps increase muscle mass and size and Glutamine minimizes muscle breakdown to maximize muscle gains. 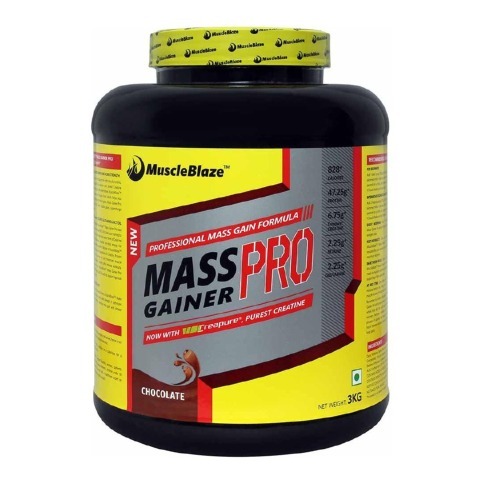 Who can consume MuscleBlaze Mass Gainer Pro? 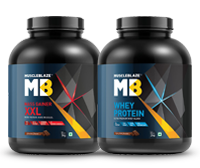 Both bodybuilding beginners and regulars can safely consume MuscleBlaze Mass Gainer Pro to transform their physique, however the dosage will differ. Bodybuilding beginners should add 1 level scoop (37.5g g) to 180ml (6oz) of skimmed milk or cold water. Blend for 45-60 seconds for a thick and creamy shake. If you've been bodybuilding for a while, mix 2 heaping scoops (75g) to 180ml (6oz) of skimmed milk or cold water. Blend for 45-60 seconds for a thick and creamy shake. Drink 1-3 such shakes every day for unadulterated muscle gains. How to consume MuscleBlaze Mass Gainer Pro? Early Morning: Begin your day with MuscleBlaze Mass Gainer Pro and have it along with breakfast to remain energetic throughout the day. Post-Workout: Drink one shake of MuscleBlaze Mass Gainer Pro, 30-40 minutes after workout to expedite recovery. In-between Meals: Drink one shake of MuscleBlaze Mass Gainer Pro in between meals and maintain high positive nitrogen balance, required for building muscles. Additionally, this shake will support your high calorie needs. At Bedtime: A shake of MuscleBlaze Mass Gainer Pro 45-60 minutes before you sleep fuels muscle recovery throughout the night.